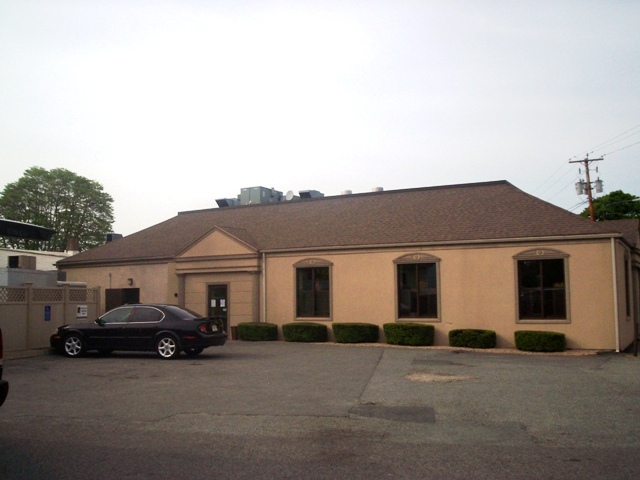 In 1961 the REAL Fay and her brother Mike opened the original " FAY'S KNOTTY PINE " in the north end of New Bedford . It quickly became a hit and later a legend . 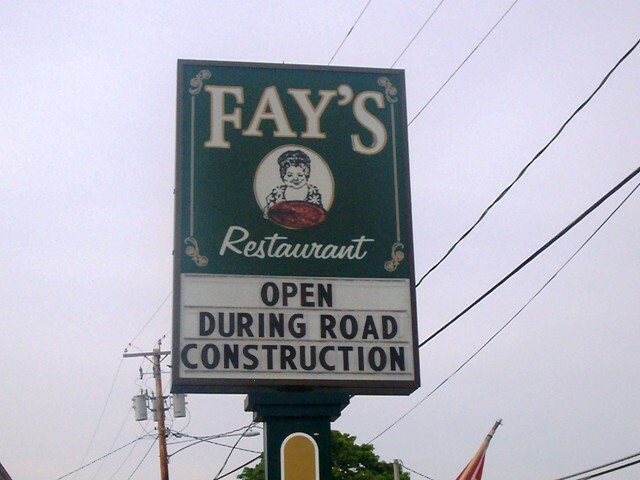 Now located in South Dartmouth , Fay's still receives excellent reviews from her legion of fans . Through word of mouth ( and several on-line food sites) Fay's reputation for great food came to my attention . That's how it came to pass that at 3:33pm. on Saturday May 22nd. Laura & I found ourselves in Fay's parking lot . We walked in to find a cool quiet oasis from the hot dreary weather outside . Fay's is all wooden booths and tables , homey decor ( lots of pix of lovely children ) and spotlessly clean . Our terrific waitress Susan came right over with menus and took our drink orders : 2-Diet Pepsis . I told Laura everyone raved about the pizzas here and she was in the mood to give them a test drive . LOL I was in the mood for Italian ( when am I not ? ) so while our drinks were being " fetched " we perused the rather large menu . They have appetizers like : wings , rings , skins & sticks ( you know what I mean ) . But they also have : crab cakes , calamari , toasted ravioli and mussels ( Portuguese style ) . They have all kinds of salads including a strawberry and feta and an antipasto . They have lunch specials from 11:30pm. - 4:00pm. that include quahog & chowder , quesadillas , burger & sandwiches and much more . 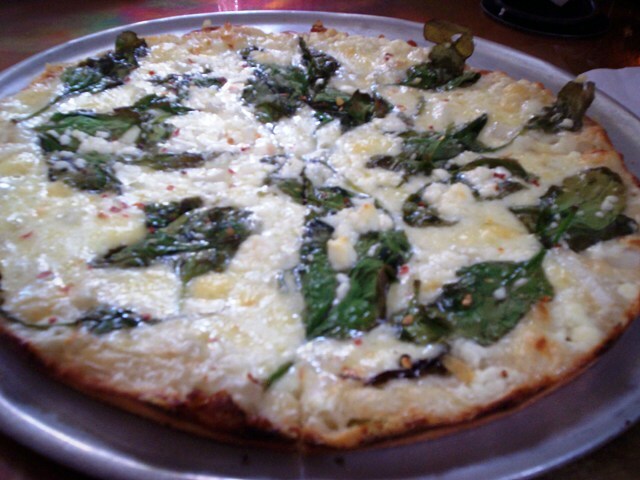 Also they have those terrific pizzas you can design yourself or specialty pizzas like : Basil Bianco , Blonde Greco and Clam Casino . Also on their menu are soups , specialty sandwiches ( Venetian , Tuscano , Milano - all descriptions on their web-site ) , and all manner of chicken , pastas , seafood ( huge selection ) and beef & veal selections . They also have a section of " SMART " choice dinners and sides for those wanting lighter options ( what I SHOULD choose but never do ) LOL . Kids have some popular dishes to choose from and FAY's also has large take-out platters for parties . And last , but never least ( in my book ) are the desserts : apple blossom , molten chocolate volcano , bananas foster and more . YUM ! When Susan dropped off our drinks , she took our order : for Laura , a BLONDE GRECO PIZZA and for me , BAKED LASAGNA . After a reasonable wait , we got our order . VERDICT : OMG ! To die for !!!! Laura's pizza was a white pizza ( no sauce ) with fresh spinach , feta cheese , onions and Italian seasonings . She said it was outstanding . Everything was so fresh and the crust was perfect , thin and crisp but not " crunchy " . She ate every slice . It was a pizza for 1 person's meal , right ????? Oh well .I absolutely LOVED my lasagna . It came in a little silver serving dish and was a perfect size . 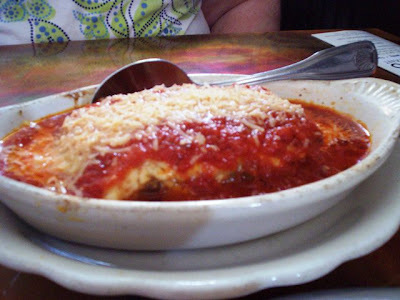 And the taste ....it went right up my list for BEST lasagnas . It was so homemade tasting and the sauce was so fresh and light . It couldn't have been better . Pasta , meat , creamy ricotta , white cheddar cheese topped with their house marinara , what more could you want ? Fantastic . 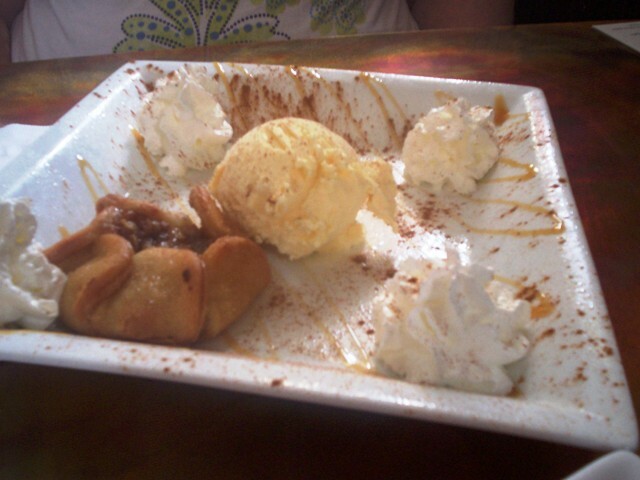 Then , since everything had been so great , Laura and I did a fairly rare thing for us ....we ordered dessert . I decided to try the APPLE BLOSSOM ( diced apples in a warm cinnamon sauce , wrapped in puff pastry , served with vanilla ice cream and dusted with cinnamon .) It was heaven on a plate . 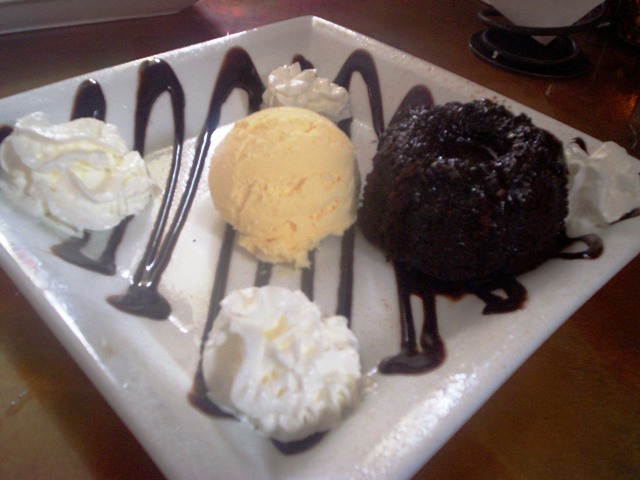 And Laura went with the MOLTEN CHOCOLATE VOLCANO (warm chocolate bundt cake with a chocolate fudge center served with vanilla ice cream , drizzled with warm chocolate sauce and topped with whipped cream . ) OH MY !!!! We both tasted each other's and declared them delicious . We would definitely go back to FAY's . As a matter of fact , we went back the next week . LOL Laura had the BASIL BIANCO PIZZA and I had PASTA WITH GROUND LINGUICA . Plus this time we started with TOASTED RAVIOLI . Everything was absolute perfection . Now I can see what all that talk was about . I'm only sorry we waited so long to go here . We'll be back .....hummmmm....maybe this week . And as is our habit , we checked out the ladies room before we left and found it immaculate . We left a 20% tip for the terrific Susan , so $ 39.00 was left on the table . Not bad for such a fantastic meal . Get yourself to FAY's. Fay's Restaurant is open at 11:30 a.m. Tuesday through Saturday for lunch and dinner, and at 3 p.m. on Sunday for dinner. Fay's is closed on Monday. VISIT MENUJOY FOR PLENTY OF AREA RESTAURANT MENUS!